27 loyalty points Your cart will total 27 points that can be converted into a voucher of 1,08 PLN. CARBONIZER XR™ – YOU WILL HAVE ALL THE ENERGY YOU NEED! Efficient use of carbohydrate products, not only in endurance sports but also in strength-speed disciplines, helps reduce regeneration time and improves athletic results. While selecting such products and creating an effective supplementation schedule, the individuals engaged in physical activity should remember that the different chemical structure of molecules from various carbohydrates will determine the time of their passage through the digestive tract, the rate of digestion, the saturation of blood and the absorption into the muscles' working cells. During the initial stage of a training session, the required energy is supplied directly from muscle glycogen and after those resources are depleted, the reserves of glucose from liver glycogen are used. Lack of glycogen in the working muscles results in the impairment of their function and diminishes the physical effort capacity. At the same time there is an increased risk of the development of a catabolic state within the muscle tissue and the use of energy from amino acids, in order to provide strength for further activity. 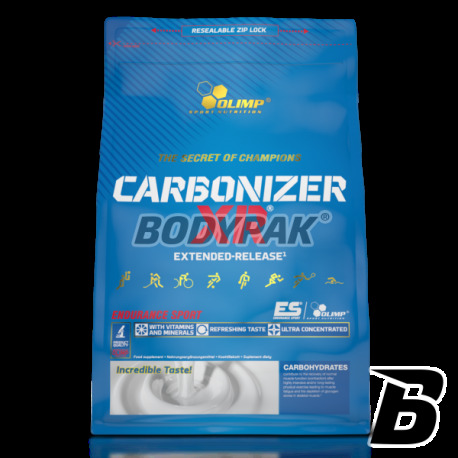 It is therefore necessary to supplement the diet – before and after the workout – with products which provide a constant supply of carbohydrates. The manufacturing of this preparation is in line with pharmaceutical standards which guarantees the highest quality! 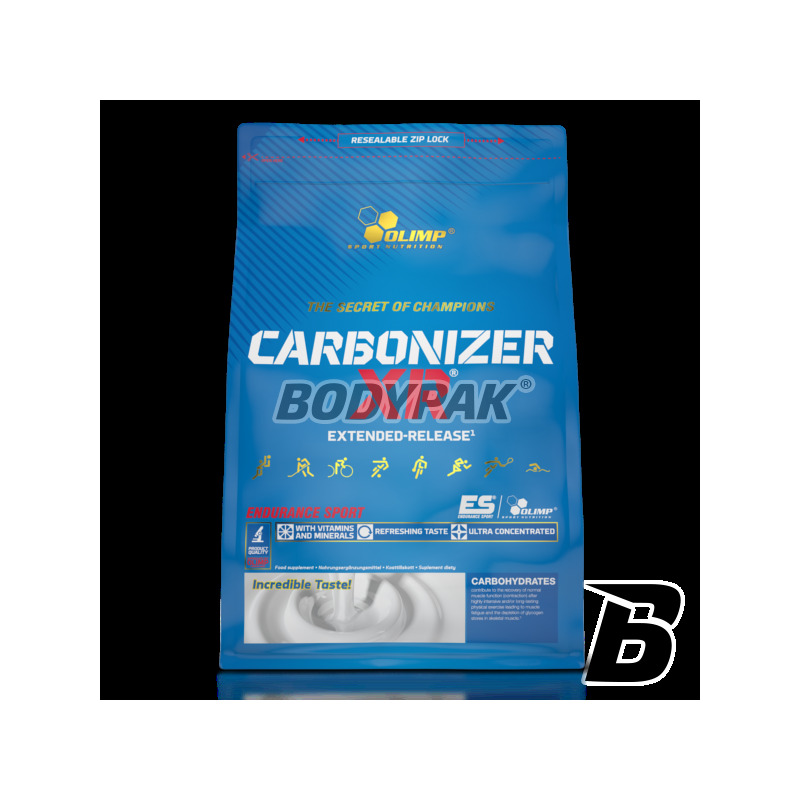 Modern, ultra-effective carbohydrate diet supplements for athletes and physically-active individuals, such as CARBONIZER XR™, are composed of various sources of carbohydrates compiled in precisely determined proportions (based on scientific research and empirical studies carried out on athletes). It guarantees the most optimal kinetics of the saturation of blood with glucose and its absorption into the working muscles, ensuring the constant supply of energy components during ongoing and prolonged workout sessions. Due to the sources of carbohydrates with higher glycemic indexes in the preparation, it is perfect for the quick replenishment of glycogen resources after even the most strenuous workouts. Don't fall for single-component, "universal" carbohydrate supplements which are supposed to be a perfect source of energy both during and immediately after prolonged workouts. Research has shown that THERE IS NO SUCH THING!!! The entire concept of extended release of monosaccharides in CARBONIZER XR™ is based on precisely determined proportions of four sources of carbohydrates (isomaltulose, waxy corn starch, fructose and maltodextrin). Three of these sources (isomaltulose, waxy corn starch and fructose) have very low glycemic indexes and as such they slowly raise the glucose level in the blood. Therefore, they constitute perfect energy sources during prolonged sessions of physical effort and may be consumed both immediately before and during the exercise. Additional low-crystallised maltodextrin guarantees the supply of fast-absorbing carbohydrates immediately before or during hypoglycaemia; these carbohydrates also have a positive influence on the effectiveness of the transport of creatine and amino acids to the muscle cells. The first such composition ever! Research has shown that providing various sources of carbohydrates is much more beneficial in terms of the total amount of glucose and the time of glucose saturation in the body than supplying the same amount of maltodextrins or other complex carbohydrates. Ingredients: 91% strength complex carbohydrates (maltodextrin, isomaltulose *, waxy corn starch, fructose), potassium salt of phosphoric acid, acidity regulator - citric acid; sodium chloride, magnesium salt, citric acid, flavors, calcium salt of phosphoric acid, acidity regulator - malic acid; 0.15% vitamins (L-ascorbic acid - vit. C, ethyl DL-α-tocopheryl - vit. E, nicotinic acid amide - niacin, retinyl acetate - vit. A, D-pantothenate - pantothenic acid, D-biotin , cyanocobalamin - vit. B12, cholecalciferol - vit. D, folic acid - folate, pyridoxine hydrochloride - vit. B6, riboflavin - vit. B2, thiamine mononitrate - vit. B1), sweeteners - sucralose, acesulfame K; coloring: beta-carotene, cochineal, riboflavin (for orange flavor), riboflavin (for lemon flavor), carmine (for strawberry flavor). * Isomaltulose is a source of glucose and fructose. Smak truskawka bardzo dobry, super się miesza z izolatem białkowym, powstaje smaczny gainer. Przedłużone uwalnianie węglowodanów nie powoduje skoków cukru we krwi, dobra opcja na długie biegi. Polecam i stosuje regularnie. Używam w dni w które mam mniej energii popijając przed i w trakcie treningu, daje mi to wtedy odczuwalną różnicę, mięśnie wolniej się męczą, mam większą wydajność. Dobra alternatywa dla Vitargo które są droższe. Wybrałem ten produkt ponieważ działa długo, zawiera mało cukrów prostych, wolny wyrzut insuliny do krwi - brak uczucia senności, ma niski indeks glikemiczny. Pomarańcza naprawdę smaczna. Dobra alternatywa dla vitargo. Fajnie się sprawdza przy wydolnościowym treningu. Carbo jak carbo, jednak w smaku bardzo dobre, wręcz wyjątkowe, więc warte swojej ceny! Provide your muscles with a rapid injection of energy! Gone are the days when you workout you did not have the strength for anything. High-quality carbohydrates delicious flavors!